After a certain limit of age every person naturally induce aging because ageing process is an inevitable process and every person has to face this sooner or later in life. However, in different people aging process may occur at different rates depending upon their unique genetic make up and specific environmental conditions. 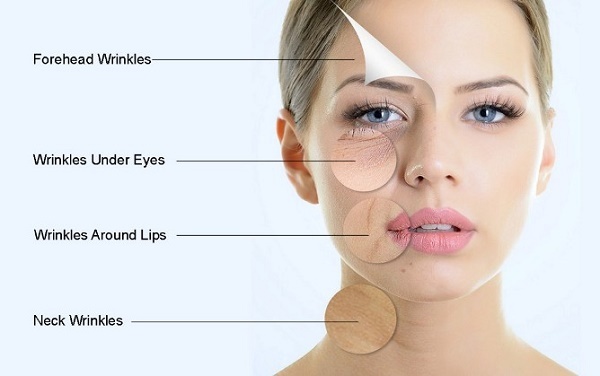 Let's have a look on some common signs of aging. To slow down aging process, try to consume foods rich in anti-oxidants. There is good evidence that oxidative damage caused by toxins and metabolism contributes to the aging process at a cellular level. Foods (but not supplements) high in antioxidants seem to protect us from oxidative stress. Try to eat Fresh fruits and vegetables containing dietary antioxidants including beta-carotene, lycopene, potassium, selenium, zinc and vitamins A, C, and E. Foods rich in antioxidants are beets, broccoli, carrots, spinach, red peppers, brussels sprouts, tomatoes, oranges, peaches, apricots, grapefruit, red grapes, blueberries, plums and papaya (papeeta). Foods rich in omega-3 fatty acids are very important to keep your skin flexible and wrinkle free. Eat fish because some evidences suggest that the omega-3 fatty acids found in fish are particularly beneficial to the skin. In addition, fish oil, cod liver oil, flaxseeds and walnuts are also good sources of omega-3 fatty acids. You should drink water from the time you get up till the time you go to bed. Try to drink at least 8-10 glasses of water on a daily basis because it helps your actual skin look flexible, vibrant and resilient and helps a lot and in flushing out waste from the body. In addition, you can help your digestive system running smoothly and stop bowel irregularity by drinking lots of water. Drinking water is the one thing that every person can benefit from. Reduce your stress level because stress is also one of the main reason of onset of aging. Regular exercise helps to release chemicals that help the body cope with stress more easily than would otherwise be the case, without exercise. In addition to exercise, yoga, deep breathing techniques and sports are some other ways to reduce stress level. Eat nuts because nuts are the perfect snack food and are filled with anti-aging fats, vitamins and minerals. Almonds, brazil nuts, cashews, pecans, pistachios and walnuts are very helpful to slow down aging process. They are also great for suppressing appetite but don’t eat more than a handful. Foods rich in Vitamin A are also very helpful to slow down aging process. Anti-oxidant properties of Vitamin A helps neutralize the damaging effects of oxidation caused by free radicals. Oxidation caused by free radicals is believed to be a primary cause of age-related degeneration and disease. Dark green and yellow vegetables and yellow fruits such as broccoli spinach, turnip greens, carrots, squash, sweet potatoes, pumpkin, cantaloupe, and apricots are good plant-based natural sources of vitamin A. Animal sources such as liver, milk, butter, cheese, and whole eggs also contain good amount of Vitamin A. If you are not getting enough vitamin A through natural food sources and decide to take vitamin A supplements, make sure not to overdose or unnecessarily high amounts. Try to take Vitamin A in adequate amount. Excessive intake of vitamin A over a long period may pose a risk to health. Vitamin C intake helps to reduce skin damage from exposure to sun rays. Vitamin C is a natural healer that stimulates the immune system while reducing the risk of heart disease, heart attack, stroke, hypertension and diabetes.Important sources of Vitamin C are oranges, tangerines, limes, guava, lemons, papayas, strawberries, black currants, grapefruit and mangoes. Many vegetables contain Vitamin C including collard greens, green and red peppers, broccoli, tomatoes, brussel sprouts, cabbage, potatoes, kale, spinach(palak), and watercress. To preserve more of the Vitamin C content, eat these fruits and vegetables raw or only slightly cooked. Vitamin D helps in the absorption of calcium, helping to form and maintain strong bones. Without Vitamin D, bones can become thin, brittle and soft. Vitamin D can be found in some dairy products, breakfast cereals, egg yolk, fish and cod liver oil. Vitamin E helps to prevent damage to cells. It is a great type of antioxidant.Vitamin E is abundant in many different types of food. Sweet potatoes and mangoes are rich in Vitamin E. Several oils including sesame, sunflower, peanut, safflower, olive, soybean and corn are good sources of Vitamin E. Nuts also contain sufficient levels of Vitamin E making walnuts, Brazil nuts, hazelnuts, sunflower seeds and almonds excellent snack foods. Butter, margarine, eggs, wheat germ, wheat germ oil, soya, yams, spinach, broccoli, corn, avocados, fortified cereals and liver are other good sources. Some green vegetables also contain small amounts of Vitamin E.
Fiber is widely recognized for promoting specific advantages in terms of health, such as the reduction of constipation, hemorrhoids and diverticulosis symptoms. A diet rich in fiber-cleans the digestive system and helps prevent cancer. Moreover, it reduces blood cholesterol and reduce risk of heart disease. It also reduces blood sugar and helps prevent diabetes. Natural fiber is contained in a variety of fruits, vegetables, whole grains, beans and legumes. Many people think that including fat in the diet is not good for the body. However, there are good fats that lower bad cholesterol (LDL) and total level of cholesterol in the blood. These fats are monounsaturated (MUFAs) and polyunsaturated fatty acids (PUFA). MUFAs are naturally present in nuts, peanut butter, avocados, sesame seeds, sesame oil, peanut oil, olive oil, canola and olive. PUFAs are naturally contained in the mayonnaise, walnuts, fish oil, corn oil, sunflower seeds, pumpkin seeds and soybeans. Omega-3 fatty acids are polyunsaturated fatty acids and can be found in salmon, tuna, mackerel, herring, walnuts and flaxseed. Natural fruit facial at least once a week is essential to get rid of dead skin cells. In addition to removing dead skin cells, natural fruit masks and packs also help to get rid of fine lines and wrinkles. Make your own facial mask with the fruit of your liking. Apricot pulp along with apricot kernel oil is very beneficial in getting rid of fine lines and wrinkles. This face mask improves skin elasticity and texture and helps in reducing the appearance of wrinkles. In addition, It provides nutrition and support to the skin so that aging is reduced. You can apply some fresh papaya pulp on your face. The fruit enzyme, called papain, exfoliates dried-out skin and reduces melanin deposition. Rub a sliced strawberry that’s infused with plenty of beta carotene and vitamin-A to aid in regeneration of collagen and helps a lot to prevent fine line and wrinkles. Natural Aloe-vera gel is yet another best homemade anti-aging skin care solution which you can use to get rid of facial lines, wrinkles and slow down aging naturally. Take some fresh aloe vera gel and apply on your face and neck. Leave for about 15 minutes and then rinse off. Try to keep yourself busy. A busy mind helps regenerate brain cells. It also stimulates and expands brain power. If you’re not using something, it will lose its ability to function properly. Use your brain cells and give meaning and purpose to your life at the same time. You can’t get involved in life if you don’t do anything meaningful and worthwhile. Brain power is a magical part of the anti-aging formula. It only requires that you 'think often'. Exercise to lose fat or simply as a form is a great way to slow aging. Regular exercise keeps the skin firm, improves elasticity of skin and prevents the formation of fine lines and wrinkles. Exercise also helps to create a radiant glow on your skin. When a person is physically active he/she can you make more growth hormone, a key factor in remaining youthful. Growth hormone plays an important role in everything including growth of skin, weight gain, muscle mass, libido or energy level. Growth hormone is essential for almost any sign and symptom you can think of related to aging. Don’t smoke because Smoking is one of the easiest ways to look older than you really are and shorten your life at the same time. Smoking constricts and damages your Blood Vessels and creates lots of problems for blood passing through them. Smoking also reduces blood flow to the skin and causes premature wrinkles more especially around the mouth and eyes, and most importantly smoking makes your skin loses elasticity and tone. Lung cancer, pulmonary diseases, blood circulatory problems, heart attack, poor vision, poor immunity, bad breath, stained teeth, dark lips, infertility and early aging are some common problems caused by smoking. Avoid Alcohol because it makes your body dehydrated, so to your skin, the amount of nutrients you absorb into your skin is reduced and makes your skin look dull, rough and dry. In addition, excess use of alcohol causes several problems including liver, pancreatic, stomach, shrinking of brain cells, dementia, infertility and sexual dysfunction. Proper and uninterrupted sleep of at least 7-8 hours is essential to maintain your health and younger look. Lack of adequate sleep, especially chronic sleep loss, can increase the likelihood of age-related diseases. Poor sleep might be far worse for you than just feeling tired because poor sleep or lack of sleep can change hormonal balance and hormonal imbalance causes various problems including high blood pressure, heart problems and stroke. Lack of sleep can also interfere with insulin sensitivity, which increases your risk of diabetes. So try to maintain a routine pattern of going to bed and waking up around the same time each day. (i) Avoid taking too much caffeine as tea, coffee, cola drinks. (ii) Say goodbye to the white bread and choose whole grain products. (iii) Replace unhealthy and processed foods with fresh fruits and vegetables because they provide your body with vital anti-oxidants that fight free-radicals which are a contributing factor to age-related illness and diseases. (iv) Avoid sugar and sugar products because sugar is a direct cause of aging and significantly reduces lifespan. (v) Always wear sunglasses when you go outside because over exposure to UV sun radiations may cause skin wrinkles around Eyes.